"If you suggested that harmony and discord as the principle law of entropy, and chaos are manifestations of the energy, life force or artistic naivete, Mr. Sakae Osugi, it become more severe at present day, beauty is not in harmony any longer but is in discord. And its realization is achieved by entirely disordering. 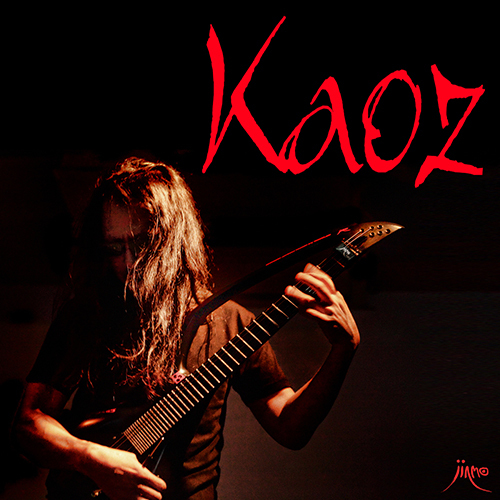 JINMO's 131st album, the title is "Kaoz". JINMO says that he suggest "gigantic chaos filled with beauty" with coined word "Kaoz". writer and anarchist about 100 years ago. as "the saint of chaos" as congenial spirits than revere. The concept of "plectics pulse" that JINMO often talks, it beautifully resonated with Sakae Osugi's declaration that "Harmony is not beauty. Beauty exists only in discord." "Plectics pulse" by JINMO, is an inherited the concept of Dr. Murray Gell-Mann, a distinguished fellow of the Santa Fe Institute known as study of complex adaptive systems, the concept which is the "simplicity" and "complexity" are not contradictory, and it is considered to be undifferentiated rhythm expression in musical time perception. it is suggested to be more free-wheeling "pulse" at the same time. it is unaccompanied guitar solo album made of just one Jinmoid. With minutely complex fast guitar play and the control many delay including reverse delay, JINMO produced chaos like this. Powerful and beautiful cover photo with red and black contrast is taken by Mr. Mixtribe. Well, there is words by Sakae Osugi which JINMO often quotes on twitter; "There is contemplation as a consequence of this activity. And there is fascination as a consequence of this contemplation. As a result of the fascination there is emotion. And this emotion calls forth further activity. Therein is no simple subjectivity or objectivity.Subjectivity and objectivity are congruent. This is my ecstatic frontier as a revolutionary...aesthetics frontier. Observe your own ecstatic, aesthetics frontier as a revolutionary in the Midst of great chaos"Kaoz" filled with beauty. but also recommend to Guitar Manias.